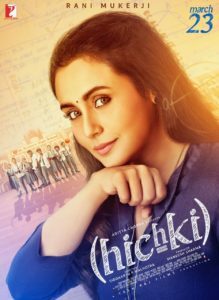 Hichki is the new heart-warming tale from Yash Raj Films starring Rani Mukherji. Like recent trends in Bollywood, it focuses on the educator and student alliance that has led to powerful films like Saala Khadoos, Sultan and Dangal. In each of its predecessors both student and teacher strive to reach redemption and at the same time complete the impossible. Owing to their action angle, they have been heavy on powerful tunes which have inspired audiences. However, Hichki does not come with a built-in action angle and so Jasleen Royal is asked to give its quirky story a thought-provoking soundtrack. From the next song, Madamji, go easy, we get the sense that not only will Rani be dealing with her own demons but also with the north-south divide that recent films have been trying to address. Sung by Benny Dayal and David Klyton, there is genuine Tamil rap mixed in with a Hinglish verse to seemingly interest all of India at once. However, outside of this there isn’t much happening on the musical side, which is both repetitive and very generic. Still a very comfortable jazz feel is maintained overall, so how it is deployed is key here. As it seems to be a background piece from the clip available on Bollyspice, it gets a 3/5 for effort. In music if you need a light, folk and acoustic feel to a song, you need a singer that can be trusted. In today’s Bollywood, look no further than Arijit Singh. Khol De Par is an Arijit special. It’s journey style rhythms will not have you floating through traffic when you have it on in the car but instead seem to inspire those listening to find peace. Arijit shows Bollywood what a lot of his work in South Indian industries sounds like with an easy ride through the smooth lyrics. In saying all this though, the song seems to lack flavour, as while this is Tollywood Arijit, it isn’t a Tollywood beat. Thus, it doesn’t rate well getting a 1.5/5 purely on the strength of Arijit. Having put Arijit through his paces, composer Jasleen Royal takes to the microphone herself to sing Teri Dastaan. There is no debate that this is a sad song from start to end, with lilting piano, sheenai thrown in for good measure and strings in minor scales. However, these instrumentations seem to almost drown out the lyrics which thus become too quiet to evoke the necessary emotions from the audience. Since its unlikely to influence the audience, this song doesn’t rate well either at 1/5. Jasleen is well known for songs on MTV so when it came to Pyar Kya Hai Ghum she picked Shilpa Rao to give a heart-warming rendition in the style from MTV Unplugged. A very light instrumentation, mostly held-up by acoustic guitar and what might be a tambourine or light snare drum, gives Shilpa full control of this song. She seems to take the reins without hesitation, however because there is little change in this setup throughout the song, it lacks any sort of pizazz to keep an audience interested. Nevertheless, Shilpa knows feel and atmosphere and how a singer gets them out, so this song recovers the album with a rating of 3.5/5. Finally, we have two theme songs which are likely to be the opening theme and the ending theme. The Soul of Hichki is handed back to Harshdeep Kaur and given a very Punjabi folk feel with harmonium and ektara backed by strings, this song wants to give the audience a taste of the soul of the other songs without giving away any story hints. This is a difficult balance to strike but again may prove critical depending on how it is used in the movie. (rating 2/5). Naina Theme is an instrumental piece which seems to give a character portrait of the main character. Strings are used for sadness, piano for realistic hopes and mixed in it all, the floating dreams.Since all humans are a mixture of sadness, hopes and dreams the song gets a rating of 2.5/5 as it again lacks in any sort of flair or glamour that would make it stand out. To sum up this album is difficult as a lot of it seems to be dependent on how the songs are being used within the context of the story and how they are tied to the progression of the main character especially. If taken as an album on its own, something to play on mp3 players or in the car for days, months or years later, it fails to inspire or evoke emotions and doesn’t seem to be in place to relieve tense moments that might pop out at cinemagoers. Individually, the singers are a strong and Jasleen Royal has played them to their strengths but as a group they fail to hit home.